I’ve waited for this game for a long time, not as long as I waited for Final Fantasy XV, but long enough. From the developer behind Ico and Shadow of the Colossus, The Last Guardian is about the bond between a boy a dog/bird/cat thing called Trico. I wanna say the game took me around 10 hours to finish, and what I learned from those 10 hours is that perhaps nothing will ever live up to the high bar set by Shadow of the Colossus, but The Last Guardian makes a good attempt at least. The story of The Last Guardian is about as straightforward as you might expect. A young boy wakes up next to Trico who is wounded and chained down. The boy frees him, feeds him, and befriends him. And together they go on a journey to escape the valley. Overall the story was very enjoyable, even if it was threadbare like its predeccessor’s. That doesn’t mean there is a story, you simply have to read into the adventure. Shadow of the Colossus was the story of a man hellbent on reviving a woman using the powers of a forbidden land, and in order to do so he had to slay 16 Colossi. The story was told, not through words, but through actions. The same is true of The Last Guardian. While the story is narrated by an older protagonist, you play out that story, the story of a boy and a beast. It’s all about the journey and nurturing that bond. The goal is to get you attached to the boy and Trico by the time the game ends. Results will of course vary. In my case, it took a lot longer for me to feel anything for Trico than I honestly would have liked. We’re talking closer to the end game, and even then it wasn’t particularly strong because of the fact that it took so long. The game tries to emotionally grab you by having a variety of things happen to Trico over the course of the story, and the two primary ways that they try to get you emotionally attached to him is by A) feeding him barrels of food, and B) Having you pull spears out of him so he can move more freely and isn’t injured. And they both work because feeding him feels like giving a pet his treat for doing a great job, and removing the spears means you don’t want anything bad to happen to him, you care about him. Throughout most of the game I waited for Trico to finish fighting enemies before I removed the spears, but towards the end of the game I kept hurling myself at Trico and trying to rip the spears out mid-battle, not because anything would have happened if I let all of them in, but because I wanted to free him from the pain and that, I imagine, was the developers intent. But again, it took me way too long to get that attached to Trico. In the end, it just didn’t match Shadow of the Colossus for me personally, but it gave it an admirable try which is really all you can ask for and I like I said earlier your mileage may vary, some people might get attached real early and it will mean a lot more to them in the long run than it did to me. The gameplay of The Last Guardian is about as simple as its predeccessor’s. You solve puzzles, you face enemies, move on to the next area, rinse and repeat. The only difference is that the protagonist in this game really doesn’t have a way to fight on his own. Enemies will chase you and try and capture you, at which point you have to click just about every button on the controller to get free, if you don’t within a certain amount of time, it’s game over. You can knock into enemies and throw things at them, but unless you knock their heads off it won’t mean anything. I didn’t even know that that was an option while playing a game because the game doesn’t tell you it is(Not to mention the distinct lack of objects to throw.). Instead, you have to rely on Trico to fight for you and then you tend to his wounds and calm him down afterwards. When you aren’t running from enemies, you’re platforming, jumping from ledge to ledge, operating levers, the whole nine yards. This is the majority of The Last Guardian’s gameplay. It never got boring in all honesty, I loved solving the puzzles and finding ways to get places that I didn’t think were reachable. And when Trico starts taking commands from you things get a little complex because no Trico is taken into account when navigating the puzzles. This makes up the bulk of your playtime. The Last Guardian uses a combination of photo-realism and cel-shading to achieve its unique appearance. The main protagonist as well as every other human are cel-shaded and the foliage also appears to at least be somewhat cel-shaded. 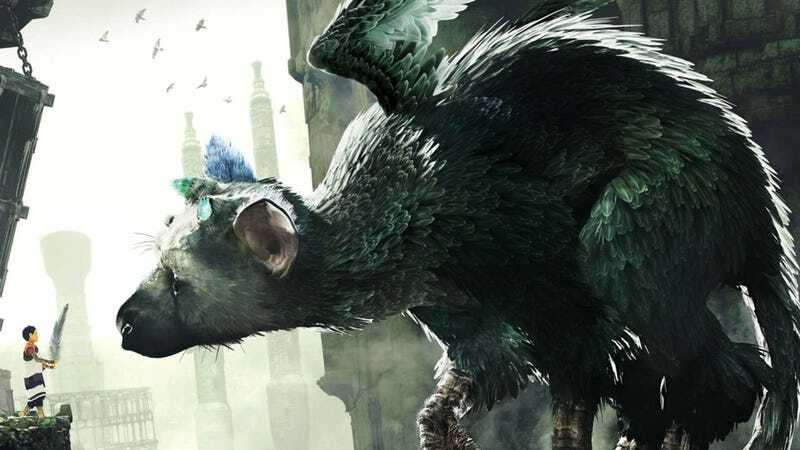 Trico, the enemies, and the vast majority of the structures in the game are rendered photo-realistically, especially Trico who has individual feathers that move, they aren’t static. In terms of the aesthetics, the game largely resembles Shadow of the Colossus and Ico in some aspects, which is to be expected because if I recall the director game said many years back that The Last Guardian takes places in the same world as Ico and Shadow of the Colossus. Shame that I couldn’t find anything to connect the games together. However, I do have a few negative things to get off my chest. The first is the big one for me at that is that, on the PS4 Pro, The Last Guardian still has massive framerate drops from time to time. And since I don’t have a normal PS4 to compare it too, I can’t tell if these drops are the same, less severe, or more severe. I also can’t tell what about the general graphics was improved. I don’t have a 4K TV so obviously I’m not counting a resolution difference, but I did notice some low rez textures here and there. And, I have to admit, sometimes I felt like I was looking at a PS3 game. Something just didn’t feel like it fit with how a PS4 game should look. Now obviously the lighting, how Trico is rendered, all of that is definitely PS4 powered, especially the massive amount of foliage, but sometimes it just doesn’t look all that different from something you’d find on the PS3. The sound design for The Last Guardian is actually fairly impressive. From the sound of Trico’s footsteps, the flaps of his wings, his equivalent of a roar or howl, crumbling stone and breaking wood, and even distant sounds, it’s all great. Heck, you can call out to Trico when he’s far behind you and he’ll call back and you can actually pinpoint where the sound came from. As for the soundtrack, it’s actually really good. It stands out from Shadow of the Colossus in that it sounds more like something you’d hear come out of Hollywood whereas SotC sounded like grandiose video game music. That being said I still prefer SotC’s soundtrack, but The Last Guardian’s OST is great and I highly recommend giving it a listen away from the game. The Last Guardian is worthy successor to Ico and Shadow of the Colossus, but it doesn’t quite live up to the latter’s legacy. However, on its own The Last Guardian is a blast to play and clearly a lot of love, blood, sweat, and tears went into the production of this game. No expense was spared in trying to make it the best damn game it could be and it shows. The question now is whether or not another game set in this world will be made considering the games directior went freelance a couple years ago and was kept on the project as a contractor. If you’ve been holding off on getting The Last Guardian, I highly recommend you get it at your earliest convenience as it is definitely one PS4 title you really should experience.